Unfortunately it is not easy for Brazilians to gamble openly without fear of prosecution and this all stems from the early 1940s when the Brazilian government passed the Criminal Contravention Act. This new Act made all forms of unauthorized sports betting illegal. Just five years later, in 1946, President Eurico Gaspar Dutra then went on to ban all forms of sports betting, with the exception of horse racing. 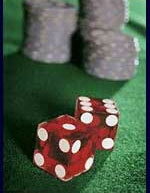 This new legislation also included a ban on land-based casinos and other similar gambling venues. This ban has remained in place ever since, but over the years certain forms of gambling such as bingo and lottery have been added to a list of permitted forms of gambling. The government made an effort in the 1960’s to formerly close all land based casinos, but there was also a loophole in Brazilian law which meant that certain land based gaming machines were not actually affected by the ban. This lead to a sharp rise in gaming machines and according to reports, there are now more than 100,000 such machines spread across the nation and there are hundreds of legal Bingo Houses. The Brazilian government will therefore not issue licenses to online gambling operators and you will find that there are NO online casinos that operate from within Brazilian boarders. This doesn’t mean that Brazilians cannot gamble online in an online casino, they just have to play at sites which operate from one of several offshore locations. Some of these sites can be displayed in Portuguese and many of them also now accept Brazilian Real (BRL). The most secure Brazilian online casinos tend to be licensed either in Malta (by the Malta Gaming Authority – formerly the Lotteries & Gaming Authority of Malta), in Kahnawake, Quebec, Canada (by the Kahnawake Gaming Commission) in Curacao (formerly Netherlands Antilles, by the Curacao Internet Gaming Association / CIGA), or in Antigua and Barbuda (by the Directorate of Offshore Gaming), in Gibraltar (by the Government of Gibraltar) or in the United Kingdom (by the UK Gambling Commission). Today’s best Brazilian online casinos tend to be powered either by Realtime Gaming (RTG), Microgaming, Playtech or Net Entertainment (NetEnt), you need to be at least 18 years old to sign up to one of these casinos and they currently accept a growing number of payment methods which are suitable for Brazilian players. In December 2012, the Senate committee for science, technology, innovation, communication and computing attempted to block credit card transactions to online gambling portals, but it is still actually possible to send funds to and from offshore based online casinos using a Brazilian credit/debit card. Head over to our online casino review section where you can find mini summary’s for some of today’s best Brazilian online casinos. The Brazil Business - Interesting article about gambling in Brazil and the current state of this activity for those who reside in Brazil. Also features some information towards the end of the article pertaining to online gambling in Brazil.